The theories expounded and words written about this small Midlothian chapel are legion. Until fairly recently, the interest in the building and its legends was confined to a relatively small band of people. They tended to be academics, historians and members of various quasi-religious groups, e.g. the Freemasons, the Rosicrucians and the modern Scottish branch of the Knights Templar more correctly known as the Militi Templi Scotia. In the past few years however, the building and its grounds have become a magnet for thousands of people from all over the world almost as if they were on a pilgrimage. The reasons for this virtual pilgrimage (in spite of appearances to the contrary) are in the last analysis all related to one thing. This is the enduring enigma, whether real or imaginary, created around the alleged arcane knowledge encoded in the myriad of ornate carvings that adorn the building. Plus, and perhaps more importantly the intense speculation about what, if anything, is hidden in the vaults deep below the chapel. If the stories are to be believed, Sir William St.Clair when he inaugurated the building of the chapel, intended to create an enduring legacy, a legacy immortalised in stone, a legacy that was there for all to see, a legacy that would carry occult, ancient knowledge down through the generations. The building could on many occasions have been desecrated or destroyed, most notably by Oliver Cromwell, a man not noted for his sensitivity. The fact that he chose to spare it is almost certainly due to its masonic connections. Cromwell was himself a freemason and it is probable that knowledge of Rosslyn and its links with the craft was even then well known. The knowledge encoded in the designs is not intended for the uninitiated; rather it takes the form of images, allegories and precise measurements taken from diverse beliefs and traditions. Masonic, Templar, Alchemical, and Pythagorean teachings all are represented here. Indeed, it is likely that there is much more hidden among the rich and ornate carvings, the more one looks the more one sees and feels. There is an indefinable aura of tranquillity and power here, quite separate from the contemplative silence found in most churches; this is an almost tangible sensation. There is in my experience only one other place that has a similar aura and mystique. This is at the alleged birthplace of Jesus Christ beneath the Church of the Nativity in Bethlehem where the sense of being in a place of immense spiritual importance is breathtaking. The chapel is at present a conventional operating church, The Collegiate Church of St. Matthew where the faithful meet for regular worship every Sunday. No doubt the constant theorising and speculation is annoying for them, but it is often the case that in circumstances such as this, familiarity breeds contempt. A similar situation exists when one considers the Pyramids. If you ever have the opportunity to visit these magnificent ancient monuments, you will find that the local people are so used to them that they are completely blasé. Their sheer physical presence, their gigantic almost surreal stark beauty and what they represent usually overawe the visitor. The locals however seem utterly indifferent to them, except as a means of extracting money from the awe-struck tourists. So, to a lesser degree, we find the same situation at Rosslyn. Even here there is now a tearoom and gift shop, although, to be fair, these along with the tourists are probably necessary to help fund the upkeep of the ancient building. 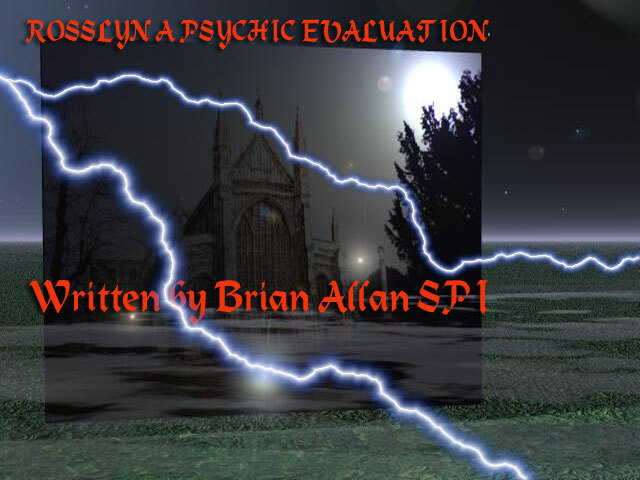 We at S.P.I felt that because of the continuing speculation regarding Rosslyn and its contents, we would carry out this survey using the services of the clairvoyants who are kind enough to assist us in our researches. We put this suggestion to them and to our delight, they agreed. To make things more interesting, none of the clairvoyants have been to Rosslyn before. The only knowledge that they have has been gleaned from newspapers etc., so what they discover will be interesting. I made contact with the trustees at Rosslyn through Mr. Stewart Beattie who looks after the day-to-day logistics of running the chapel for the trustees. Following some correspondence, we were granted permission to visit and test out theories. We set the date for Sunday, May the 16th; this would be of necessity be at 1200 hrs after the regular service had concluded. In the intervening period, I had requested from Mr. Beattie a floor plan of the chapel, which duly arrived. My intention was to have one of our clairvoyants, Annmarie Sneddon, examine the plan and try her dowsing technique on it. This produced a surprising result when she detected an anomaly at the North East corner of the plan where the ‘Lady Chapel’ is situated. The anomaly caused her dowsing pendulum to oscillate wildly and she also had the strong impression of a sword suspended in the air above it point down. The only knowledge that I have about this area of the chapel is that there is one of three bodies, all female members of the St. Clair family interred beneath it .The tomb is clearly marked with a large, engraved brass plaque set into the floor. On the plan, this small area is shown with dotted lines forming a rudimentary union flag. I contacted Mr. Beattie and enquired about this but he told me that the book the plan had been reproduced from did not include an explanation; consequently, he could not assist us. In the days just before our visit to the chapel, Annmarie was unable to sleep and received a series of images relating to the building, particularly the Lady Chapel. One definite feeling was that (as other people have suspected) sound is a key part of the puzzle, in particular an odd high-pitched note. Another impression was that the main outcome of our visit would not relate to the vaults and their contents, but to the ‘Lady Chapel’ and what it represented. She had told me of her suspicions regarding what was here, if she was correct then this small section of the main chapel contained a force, an energy that in the right hands had the power for great good, or, in the wrong hands, for great evil. According to Annemarie there are only five of these sites around the world, one is in a Pyramid on the Giza plateau in Egypt, one is in North America, one is high in the Andes Mountains of South America, another is in Africa, now we know that there is one in Rosslyn Chapel. These singular, strange, powerful, potentially dangerous objects are ‘Astral Doorways’. As we shall see, this proved to be a unique experience. My wife who has a general interest in what S.P.I does, accompanied Billy and I on the investigation, this was a bonus in that she would be a fairly unbiased observer to anything that might happen that day. We arrived at the chapel on the Sunday just before mid-day to find Annemarie and Jim already there. We chatted for a few moments until Ian and Mhari Shanes who were equally keen to begin joined us. Identifying ourselves, we chatted briefly to the attendants at the entrance and souvenir shop, then exited into the grounds. We entered the beautiful old chapel just as the congregation were leaving, there was a choir singing unaccompanied by any musical instruments. The purity of the voices ringing around the old stones of the building was a truly emotional experience and enhanced the powerful feeling of serenity and timelessness. In counterpoint to this tranquillity I have never seen our psychic friends so enthused or energised, it was obvious that the power of the place was making itself felt. I decided to follow Annemarie and Jim recording their reactions on videotape. Billy tailed Ian and Mhari, also recording their responses. I was concerned that in spite of the beautiful singing, the people in the chapel would have a distracting effect on the clairvoyants, but fortunately, the choir left within about 10 minutes of our arrival. Jim and Annmarie went to the East end of the chapel, where Annemarie could see the spiritual figure of a Templar knight standing at the wall right beside where she had detected the ‘Astral Doorway’. The figure seemed to be in the actual stonework of the building. I could discern this figure; in appearance, it was reminiscent of the figure on the Turin Shroud. Both of the clairvoyants were obviously aware of a great deal more than I, of the two, Jim was the more engrossed and seemed to be literally in another world. Annemarie walked over to the left hand corner of the Lady Chapel and paused for a moment, and then slowly turned in a circle, her eyes were closed. She paused and stood with her back to the wall, crossed her arms over her chest and again, her eyes were still closed. She opened her eyes and smiled, obviously pleased with what she had found. I called Jim over to where we stood; I had to call several times as he was deep in thought. He walked over to us; he and Annemarie discussed her discovery. I experienced a thrill of excitement when I was asked to stand in the area and enter the aura of the energy field. My wife who had been watching the procedings came over, I handed her the camcorder to continue taping. I stood with my back to the East wall, extended my arms palms down, closed my eyes and relaxed. I quickly felt something resilient under my hands and arms as if they were being gently pushed upwards. Annemarie said that she would intensify the feeling, I was aware of her moving her hands over my head. The physical sensation was like being pushed upwards, a force beneath my heels, lifting me. In a matter of seconds, I opened my eyes and stumbled forward as if standing on a steep slope, the feeling was quite unusual. I asked my wife if she would like to try this, she agreed. She also felt the sensation of being lifted upwards as she stood in the corner. Annemarie explained what this ‘Astral Door’ was and what it could do. She was at great pains to emphasise what a unique thing this is. This very rare anomaly provides a ‘tunnel’ between the physical and the spiritual world, a two way street, in other words, things go in and more importantly come out. Jim, who had been quietly observing, joined in and explained that entire races had gone through doors like this. The older races had known about these things and although treating them with great reverence and respect had used them at their will. Is it possible that race memories of these portals still exist, finding expression in the invention and speculation of science fiction writers and their matter transmitters? Or is there a more natural - but still incredible - parallel with current research done on quantum mechanics by theoretical physicists and the possibility of ‘worm holes’, rips in the space time continuum leading to other galaxies. Annemarie explained that she could probably open the portal but she did not think it would be safe to do so as the risks outweighed the advantages. Besides, it could only be opened a tiny fraction at a time and a gatekeeper would have to be found and left with it to safeguard what was on this side. While this was going on, I was surprised to hear loud singing behind me. This proved to be a large, dark haired American lady who was accompanied by a younger woman, as they strolled around the chapel she would burst into song as the mood took her. The music was the kind of material that gospel choirs perform. She was good, very good, and loud, very very loud. She came over to where we were and stood facing the body of the chapel, she burst into song again, nothing complete just sections of various gospel songs. At this time, Annemarie was trying to meditate and I expected that the singing was disturbing her. Quite the opposite, the singing had an unexpected result. She opened her eyes and beckoned me across, “This is how we produce the sound that I heard,” she said. I asked if she wanted me to ask if the lady would oblige, she nodded in agreement. I asked the singer if she would help and explained what we needed. She seemed at bit bemused at first until I told her of the theory that music - or sound - held the key to unlocking the enigmatic secret of the chapel, to our delight she agreed to try. Annemarie tried to approximate the sound, the American singer listened intently then closing her eyes, she began to reproduce the sound. We listened as she increased the pitch and volume of her voice. Her voice reached a plateau of sound and levelled off. “How about that, is that what you need?” she asked. Annemarie nodded her head and replied,” Can you try again”? The woman smiled and turned away facing back down to the church again. She opened her mouth and the powerful voice reverberated around the church. Her voice rose in pitch until she once again she achieved the note. The whole chapel seemed to reverberate, almost ring in sympathy with the tone. Everyone in the building had paused to watch what was happening; abruptly she stopped, shook her head and smiled. In the sudden silence there was a faint resonance, almost a humming sound from the walls then slowly the normal background noises picked up again as people turned away, almost embarrassed. We thanked the woman who, with her companion, left shortly after, still emitting gospel phrases. Our impression was that we were on the right track, the sound had, in our opinion caused an odd resonant humming sound in the building. This is a line of investigation that we will pursue as in tends to confirm other similar lines of inquiry currently being investigated by other people. At this point, I left the clairvoyants and slowly strolled around the chapel looking at the sheer complexity of the carvings, the ‘Green Men’, the scrollwork, the flowers and figures, the dragon chasing its tail around the base of the unique ‘Apprentice Pillar’. This building is a genuine masterpiece, a treasury of the masons’ art in all its variety. I saw Mhari Shanes standing in the centre aisle of the chapel and went across to her; she was obviously still receiving strong impressions of the place. “The man who built this place was almost a ‘Merlin’ figure, I can guarantee that he knew exactly what he had here” .She went on to explain that she had the distinct impression he was probably an alchemist and mathematician, certainly a man who was in tune with the energy of the area. This building was constructed on the ruins of an earlier site of worship probably going back to pre-Christian times. These structures were not here by accident; none of them, this area was a nexus of power, a meeting place of many ‘Ley-Lines.’ Mhari closed her eyes and stretched out her hands. “I can see him, standing right here, it’s as if he is holding the ‘Ley-Lines’ like reins, driving this place. This isn’t a building in the strict sense, this is a machine, it’s like a mechanism”. She went on, “This building does not stay still, it moves, it changes with the seasons, it breathes. It doesn’t stay totally in this time frame, its like a fluid”. “ The treasure here isn’t anything material, it’s the energy and it’s here, below us, in the vaults.” She indicated two stained glass windows set high up hear the ceiling. “These two windows show the changes, if you were to observe them carefully over the year, you would see the seasonal changes”. “For example, a flower will bloom or a leaf will fall, there will be some small change in the detail”. I was quite taken aback and felt a thrill of excitement, if anyone would know about this then these talented people would. I have observed Mhari on several investigations; I had never seen her as animated and positive as this. I asked her if she could see anything over in the corner at the Lady Chapel where the astral doorway was located, she smiled, “I can see it from here” she said. I asked her to describe it. “It’s like a curtain, a shimmering violet curtain, “I would like to go over and see if I can pass through it”. This was exciting news and a form of corroboration. Annemarie saw it as a column of white light, Mhari perceived it as a shimmering curtain. Yes, the perception was different, but the image was still there. This corner was indeed very special, but there was more. Anyone getting too close was in danger of ‘falling through’ into another plane of existence. In the right hand corner, Mhari could see a guardian of some kind. He was there to prevent anyone getting too close to the real secret of the chapel. Not to physically prevent them by force, instead he would ‘deflect’ them; in some way stop them seeing the next stage, the next step. Mhari commented that she had been communicating with him, but now that she had noticed the ‘doorway’, he was ignoring her as if annoyed that she had detected the anomaly. We moved over to the Lady Chapel again, my wife, Annemarie, Jim, Billy and Ian had joined us. We stood in the corner around the plaque on the floor, which marked the last resting place of a member of the Sinclair family. Mhari was clearly emotional, becoming quite agitated, she reached out her hands as if about to touch someone, “I can see their hands reaching for me, they want to come through, I can feel their pain”, she looked at me, “There’s someone behind you, a guide, someone else, God fearing, strict”. Although I had never met him, this sounded like my paternal grandfather. The description would fit in with what I remembered of my father and my grandmother, so it was probably accurate. Unfortunately, a number of people were beginning to gather round and Mhari was becoming more upset so in effect she shut off and did not continue. It was now about 3 o’clock and we felt like a break, so we retired to the coffee shop to relax and chat about what we had seen, Billy told me that Mhari had gone outside the chapel and he had followed to record what was happening. She had detected several structures below the ground and much to our delight this was later corroborated. She also felt that there should be another door in the wall, it turned out that there had been but it had been sealed up many years ago. Ian had as usual gone off on his own as his ‘helpers’ directed and had been involved in various conversations with ‘spirit people’ who were around the building. We were joined by a reporter from ‘The Scotsman’ newspaper who had expressed an interest in covering the investigation, he had brought a photographer with him and unfortunately this led to a bit of a problem with the Chapel staff who were adamant that there would be no photographs taken. No amount of discussion or persuasion would alter their stance so the net result was “No photographs please”. The reporter, Rab McNeil did in fact conduct the interview which later appeared as a feature in the ‘Scotsman’ newspaper. To be fair, Rab came with us into the Chapel and Annemarie invited him to experience the Astral Doorway which he did, although without much evident success. He left shortly after this, so we went back into the chapel where we chatted to Jim Munro who was showing a party of Freemasons around the chapel pointing out some of the masonic influences .He was very interested in what we were doing and volunteered, once he had finished his tour, to show us some sections of the building that would be of special interest to the clairvoyants. We gratefully accepted and waited for him to finish, as we waited the sound of singing drifted up from the crypt. We walked over and carefully descended the worn stairs into the gloom. There were about 20 people, mostly women, in the crypt, standing in the four corners in groups of five. Placed on the floor in the middle of the crypt was a selection of recording equipment that was in use. We stood in silence enjoying the beauty of the singing that was similar in vein to a Gregorian chant. The singers were French and on making enquiries, we discovered that they were part of a larger group of people who on a rota travel to Rosslyn once a month to perform this music. The music is written by a French curate and is specifically intended to be performed solely at Rosslyn. We did not manage to discover the reason for this virtual pilgrimage but will make every effort to do so. It does however serve as another illustration of the magnetic attraction exerted by this small Midlothian shrine. Unfortunately, the singers finished a few moments later and began packing up their equipment but we were joined a few moments later by Jim Munro who was keen to show us areas of interest in the crypt. There is a small room set into the North wall of the crypt, its original function is unclear but the consensus is that it was used for the storing of plans and sketches during the building of the chapel. Jim ushered us into the room and closed the door. The room is quite small and there were seven of us so space was restricted. Jim told us that psychics normally felt quite at home here. All of our clairvoyants sensed great power here Mhari clarified this by saying that there was a nexus here beneath us where several ley lines joined. Jim then indicated one of the flagstones and asked that one of us stood there. I quickly complied. He told me to close my eyes, relax and tell him what I could feel. I felt myself begin to gently sway back and forth, the oscillations gradually becoming more pronounced. The flagstone began to feel as if it were moving, undulating beneath my feet, becoming fluid. I opened my eyes and saw Ian standing right in front of me; one of his hands was behind my back the other at my chest, he was standing ready in case I fell over. I was able to recount my impressions to the group; the psychics agreed that this was typical of areas of power such as this. We stood in silence for a few moments absorbing the total tranquillity of the place then moved back into the crypt again. Jim Munro told us that there were other areas of the chapel and crypt, which produced a similar effect, but not as strongly as the area in the small anteroom. As something of a surprise we noticed the time that had zipped by almost unnoticed, our four hours had passed in a flash. We made our way out of the chapel and thanked the staff for their forbearance. In the car park we stood and chatted about the days events, one thing that did emerge from our discussions was the conclusion that there is much more information to glean from the building. Whatever William Sinclair’s intentions were when he ordered its construction, the chapel hides its secrets well, there is no easy is answer, no ‘quick fix’, but as long as human beings have curiosity, the solution will be found.